A Gauteng-based ambulance operator, Buthelezi EMS, that is currently the subject of both Hawks and Treasury investigations has scored road and air ambulance contracts in the so-called Premier league provinces amounting to over a Billion Rand since 2013 and they are frontrunners to secure a lucrative new three year tender for Emergency Medical Services in the Free State. 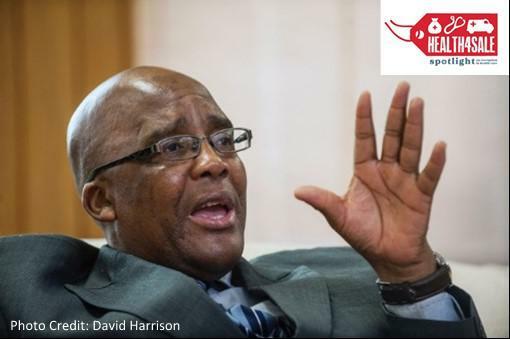 National Health Minister Dr Aaron Motsoaledi last Thursday told Spotlight that he asked Treasury to investigate the Free State and North West’s contracts with Buthelezi EMS. He also made it clear that he did not want the new Free State tender to be awarded at all and that the national department is not in favour of outsourcing ambulance services to private companies. 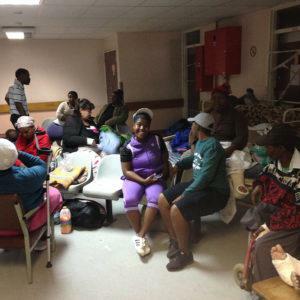 Yet, on Friday afternoon the Free State Department of health told Spotlight that the award of the tender for outsourced ambulance services is going ahead and that the evaluation of bids is at an advanced stage. Free State Health MEC Butana Khompela previously said that he does not want to re-appoint Buthelezi EMS, but he too hasn’t given any indication that the new tender will not be awarded. 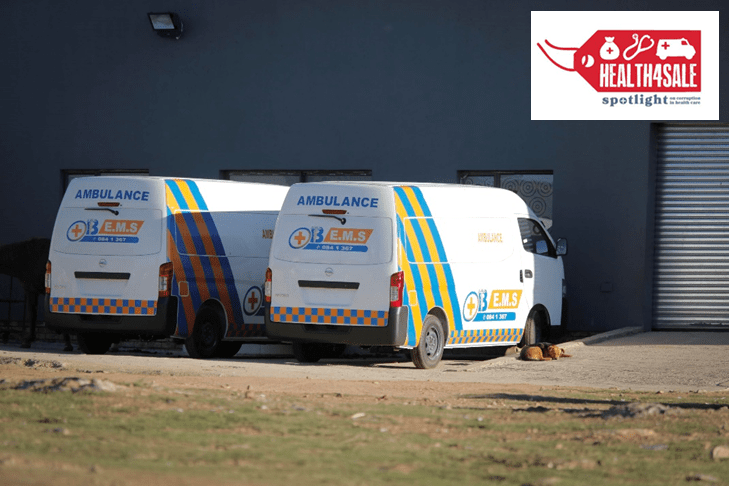 The director of a rival ground ambulance company told Spotlight that industry rumours are that another company will front for Buthelezi EMS in the Free State and that such fronting is nothing new in the industry. While Spotlight could not find any evidence of fronting, Companies and Intellectual Property Commission records paint a complicated web of connections. So, for example, Thapelo Buthelezi of Buthelezi EMS and Clifford Mahlo, director of High Care EMS, are also listed as co-directors of two other companies. Both Buthelezi and Mahlo were previously co-directors of ambulance companies with Thomas Maponya, the director of Maponya 911 Rescue. Several well-placed sources have told Spotlight that Buthelezi has been receiving special briefings from health department officials in the Free State. 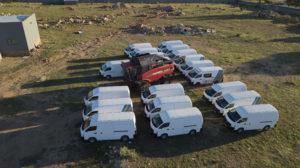 Aerial pics and the pics over the wall of ambulances: Buthelezi EMS’ new ambulances on a smallholding in Eikenhof in the south of Johannesburg waiting to be branded. The Free State Department of Health denies that Buthelezi has been given any advance notice of the outcome of the new tender. As it stands, Buthelezi EMS’s previous contract with the Free State Department of Health is being extended on a month-to-month basis until the new tender is awarded or the relevant services is absorbed back into the department. 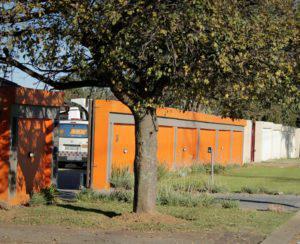 Orange wall: Buthelezi EMS’ control centre based in a house about 1km from where the new ambulances are being branded. government-run inter-facility transfer service. In August 2013 Professor Martiens Schoon reported in the South African Medical Journal that maternal mortality in the province decreased from 279/100 000 live births during 2011 to 152/100 000 live births during 2012. The improvement was mainly ascribed to the department procuring 48 new vehicles (18 dedicated to maternity care) and the use of these vehicles to transport women with pregnancy complications. For a while, this state-run programme was held up as an example for other provinces. Then everything changed when late in 2013 the province decided to outsource its inter-facility transfer ambulance service to a private company. Well placed sources in the province say that this move coincided with the scaling down of the province’s own capacity building efforts in relation to emergency medical services. The Free State Department of Health claims a tender was advertised, but Spotlight can find no record of this tender advertisement anywhere online or in a newspaper. Netcare 911, a company that would have liked to bid, says they never saw the tender advertisement despite subscribing to various systems that would alert them to such tenders. 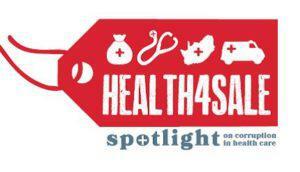 Spotlight twice asked the Free State Department of Health where the tender was advertised. Both times they dodged the question, merely saying that “The requirement to advertise tenders on-line by law only came into effect in 2016.” They did provide Spotlight with a copy of the province’s tender bulletin, but there is no indication where it was published. Buthelezi EMS was awarded the contract in December 2013 – with the contract signed on 20 December, around the festive season. What followed was ballooning expenditure and, according to a range of sources, a decline in the quality of services (see the previous article in this series for details). The Free State and North West are the only two provinces to outsource their ground ambulance service – the North West gave Buthelezi a three-year contract in March 2016. “The DA is of the strong view that the Buthelezi EMS contract is irregular, over-priced, ineffective and could possibly have links to ANC politicians, since the ANC has been on the defensive over this contract from the very beginning,” Pittaway told Spotlight. Spotlight investigations show that although the North West has been a good source of income for Buthelezi’s EMS operations, his stronghold and springboard into the so-called Premier League provinces (Free State, North West and Mpumalanga) has been via the Free State. We wrote previously about how Buthelezi was awarded a Free State air ambulance contract, that North West, Mpumalanga and Limpopo all piggy-backed on. Spotlight calculates that Buthelezi EMS has received well over R1-billion in revenue from government contracts, mostly in the Free State and North West, over the last four years – with annual revenue rising sharply over time. The year-on-year increases in the above figures raise eyebrows since the service Buthelezi EMS is contracted to provide does not change year-on-year. While some increase from the first to the second year might be explained by teething and scaling-up challenges, the steady increase over multiple years suggest another cause. This response is incompatible with the figures previously given by Mvambi. It is also not clear which year it refers to. Spotlight wrote back to the department to request clarification, but the department failed to respond. In 2015/2016 the department spent R152 million on EMS, overspending their budget by R88 million. In 2016/2017 the department spent R163 million on EMS, overspending their budget by R86 million. By the time the figures were generated, the EMS expenditure for the 2017/2018 financial year up to that point was R161, already overspending the budget by R117 million. The dramatic overspend in the Free State suggests that the province is either being charged more than expected (with invoices inflated as in the case in the North West) or the service is being used much more than anticipated. Almost everyone Spotlight spoke to suggests the former. While Buthelezi EMS’s quoted rates are in line with the industry, it is on the billing side where red lights start going off. A senior healthcare worker based at a Free State hospital alleges that Buthelezi EMS often transports multiple patients in a single ambulance as part of their inter-facility transfer service. Sometimes as many as five patients will be transported in one ambulance, but Buthelezi would allegedly then bill as if five different ambulances were used and write invoices with five different reference numbers. This pattern was confirmed by more than one healthcare worker we spoke to. (See the previous article in this series for more on the impact this has on patients) At other times, patients who could safely be transported in cars are allegedly transported at great cost in ambulances. It is also alleged that Buthelezi often charges for distances that are longer than the actual distances travelled. Spotlight was told of a case where a 2km trip was charged for as a 100km transfer. While we have not seen invoices proving such overcharging in the Free State, essentially the same allegations were repeated to us by senior hospital management as well as a well-placed person in the Department of Health in the province. This is also in line with what has been happening in the North West. Part of the problem seems to be that Buthelezi EMS often does not have Advanced Life Support (ALS) capacity in all the districts that they are supposed to – and that as a result ALS vehicles and staff must be sent from other districts – thus increasing both cost and waiting times. There has also been a shift in the Free State whereby from the 2016/2017 financial year invoices are submitted to the provincial emergency medical services Department in Mangaung, rather than to hospitals as the case was before. According to Motau, the payment of these invoices was at the same time shifted from hospital budgets to the provincial emergency medical services budget. Some senior doctors complain that this shift has made it much harder for hospitals to verify that government is not being overcharged. Spotlight sent Mr Buthelezi a long list of questions about overcharging and a number of other issues. Mr Buthelezi did not respond to any of the specific questions, but sent Spotlight an e-mail that has been published in full with a previous article in the Health4Sale series which can be read here. Despite having had revenues of over a billion Rand in the last four years, Buthelezi EMS does not have a website. The www.ButheleziEMS.co.za domain has been registered, but the site has remained under construction for the more than two years that the company has been on Spotlight’s radar. Some posts are made on the company’s Facebook page, but the kind of information one expects to find on a company with this level of revenue is nowhere to be found online. In addition, CIPC records and invoices that the company has submitted in North West (see previous article) indicate that technically Buthelezi EMS is sometimes one company, and sometimes another. In the North West the company name on invoices did not correspond to the company registration number on the same invoices. Thapelo Buthelezi is, or has been, a director of at least six different companies all named as variations of Buthelezi EMS. A number of these companies have been in deregistration due to the non-filing of annual returns. Failure to file annual returns would result in companies not having a valid tax clearance certificate, and thus not be eligible for government contracts. The Free State contracts we have seen do not contain registration numbers – which makes it hard to verify with which of the various companies the Free State are in fact contracted. In the North West, the name of the company on Buthelezi’s invoices did not correspond with the company registration number on the same invoices. Apart from the above, he is listed as a director of at least 14 other companies, including amongst others Ndizani Funeral Services, TSB Motors, Thapelo Buthelezi Hospital, TSB Medics, Ikanyezi Trading and Construction and Mt Ararat Apostles (a non-profit). Health Minister Dr Aaron Motsoaledi has asked treasury to investigate the procurement of ambulance services from Buthelezi EMS, a controversial private ambulance company that has been awarded large contracts in the Free State and North West. Spotlight this week published two articles on alleged overcharging and tender irregularities involving Buthelezi EMS and the health department in the North West as part of our Health4Sale series of investigative articles. 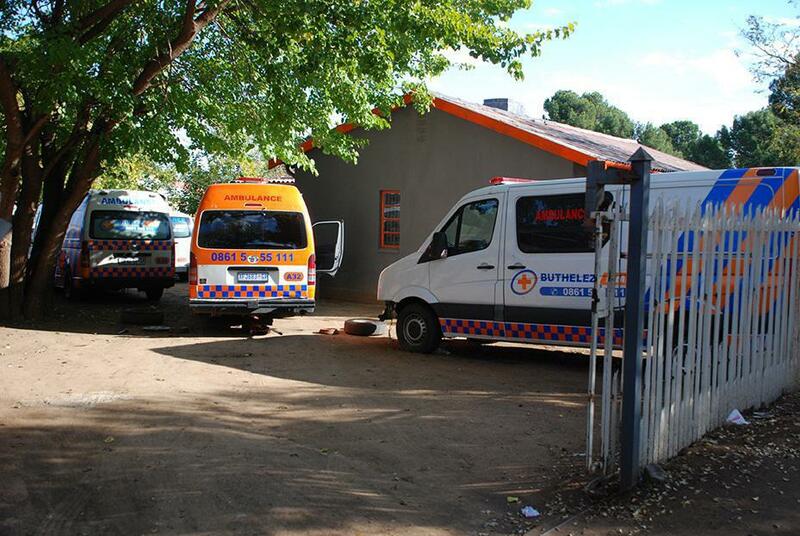 Next week we will be turning the spotlight on Buthelezi EMS in the Free State. Motsoaledi last night told Spotlight that he wrote to the Minister of Finance to request that the Chief Procurement Officer at National Treasury investigates the procurement of services from both Buthelezi EMS and the Gupta-linked Mediosa (also known as Cureva) in both the Free State and North West. Motsoaledi stressed that the treasury investigation is specifically into the procurement processes and suspected corruption. He also confirmed that the treasury investigation has already started. In terms of medical need, Motsoaledi said that there is no debate at all and that Buthelezi EMS and Mediosa are not adding value and that they are in fact causing more problems. He also said that it is not national policy to use private service providers for emergency medical services. A new tender for outsourced private ambulances in the Free State was advertised in October 2017. Spotlight however understands that the award of that tender has been delayed and that Buthelezi EMS continues to be paid on a month-to-month basis. “The plan from my side is that treasury after this investigation must make a clear ruling that the procurement of private ambulance services should not happen,” he said. Motsoaledi indicated that a Section 100 intervention whereby the Provincial Departments of Health in Free State and North West would be placed under national administration is not currently being considered. He explained that under section 100 the political leaders in the province stays in place and that national assumes responsibility without authority. 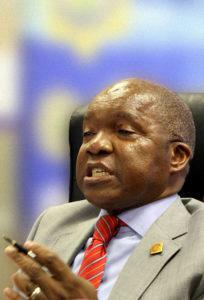 He referred to his experience when the Limpopo Department of Health was under Section 100 administration. In that case four provincial heads of department that various National Ministers believed should be removed were not removed because only the Premier of the province had the authority to remove them. 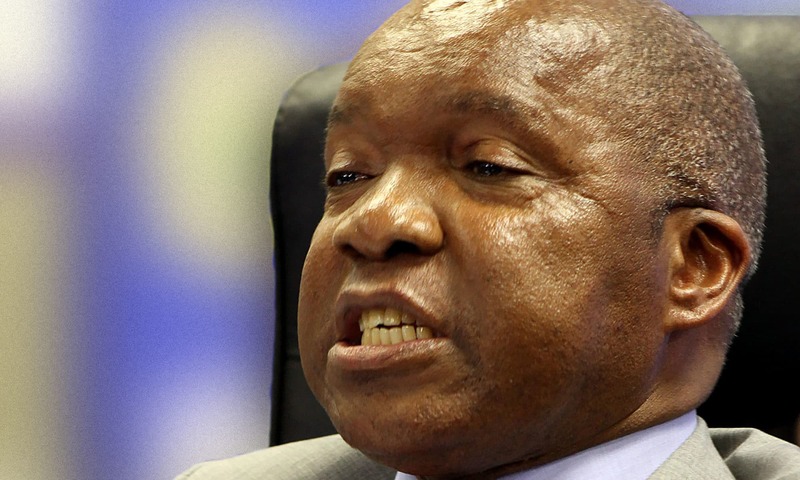 “In Limpopo we were only able to stabilise the finances because of treasury, but the human resources we could not touch because that authority does not lie with us,” he said. The Head of the North West Department of Health Thabo Lekalakala, implicated in Spotlight’s 2-part investigation into emergency medical services in the province, was suspended yesterday by the embattled North West Premier Supra Mahumapelo. Previously Mahumapelo had refused to heed Motsoaledi’s call to suspend him, placing him on special leave. State MEC for Health, Butana Khompela. Picture: Sabrina Dean. 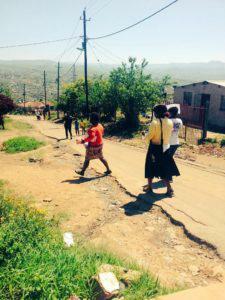 is still to exorcise the ghosts that have made the province one of the worst-performing when it comes to health. Khompela came into his role in October 2016 – replacing Dr Benny Malakoane, who was moved to the Department of Economic, Small Business Development, Tourism and Environmental Affairs. Malakoane’s exit from the Department of Health was met with relief – pure celebration, even – from activists and many Free State locals, desperate for improvement in the state health services. Their elation at seeing the back of Malakoane was because his track record in the department was woeful at best. He was routinely and widely called out for abuse of power, and for a leadership and management style that smacked of bullying and arrogance. 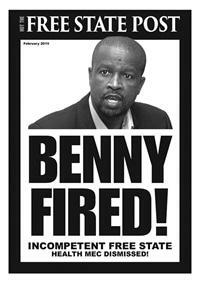 So bad was Malakoane (who served as MEC even while he faced charges of fraud, corruption and money laundering) that the Treatment Action Campaign (TAC) embarked on the intensive, two-year-long #FireBenny campaign. Finally, Malakoane was removed (albeit only sideways) and sent off with a farcical pat on the back from ANC leadership. It’s to these choppy waters that Khompela has been brought to steady the ship of an almost wrecked department, which remains under provincial administration. Its one-time top academic hospital, the Universitas Academic Hospital in Bloemfontein, tumbled to the bottom of the pile in the country in the October 2016 findings of the Office of Health Standards Compliance (OHSC). TAC notes also that a large number of vacancies remain unfilled. The information for appointments and vacancies on the Provincial Department of Health’s website simply shows ‘n/a’ under ‘current financial year information’. Just looking at the available data from the 2015/2016 financial year, however, reveals that there were 20 952 posts approved and 17 810 filled, leaving a shortfall of 3 142 vacancies – about 15% of posts – even in the previous year. Another lingering issue is the reinstatement of Community Health Workers (CHWs). There remains a black mark against the department for its shameful handling of the protests by CHWs that led to the BopheloHouse94 court case last year, eventually ending with a court ruling in favour of the 94 CHWs. Also ongoing is the issue of the use of the Buthelezi ambulances and emergency medical services in the Free State, despite the tender granted to the company being irregular, and the services being slammed for their dysfunctionality. For the 2017/2018 year, the Department of Health was assigned R9.77 billion from the provincial budget. The budget only benefited from a small year-on-year increase of 8%. In his budget address, Khompela said that “corruption is a cancer”, and promised to root it out – also, to bring down the staff bill from 65.8% to the 60% national target. He trumpeted successes in the province’s HIV programme, despite these efforts falling short of their targets, as well as the acquisition of a helicopter and an additional 12 maternity ambulances for the province. Nyathi routinely hears of scheduled operations being delayed without explanation, and says that while TAC hasn’t had reports of ARV stock-outs, there are routine drug shortages. 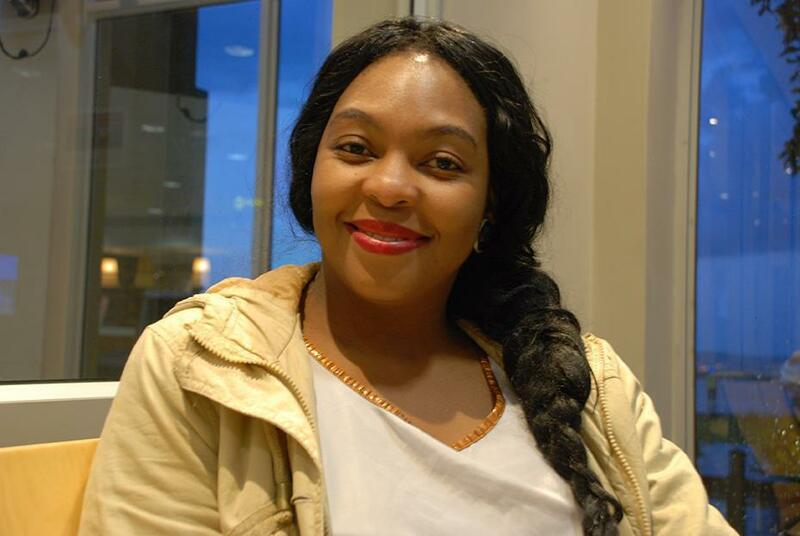 “I want Khompela to come out of his office and come to the people, so he can understand and see for himself how bad the problems are,” she says. Her hope is that Khompela will prove to be a better communicator than his predecessor, and that he will demonstrate a willingness to listen and to collaborate. For Thabo Mahlatse, TAC provincial organiser, poor infrastructure and shortage of medicines and personnel continue to be the bane of the people of the Free State. “We want Khompela to show leadership and accountability, and come up with a plan on implementation – not just what they say in speeches,” he says. Khompela’s had a mixed response from others, too. Some consider him an approachable man, and a person who is sensitive to the dire health challenges in the province. He gets a thumbs-up even from his political opponents: the Democratic Alliance, the official opposition in the province. Smoke and mirrors and a desperate need for clarity are features that extend to parts of Komphela’s official Facebook bio page, still active despite not having being updated since 2013. The 53-year-old Komphela was born in Kroonstad and grew up in a farming community, one of 11 children. His brother is the celebrity footballer, coach and Lamborghini-loving Steve Komphela. He is married to Cecilia Nombuyiselo, and they have a grown-up son and a teenaged daughter. According to the information on the page, Butana Khompela became an activist while just a school pupil. His bio data says he was among those detained along with three teachers during the 1976 uprising – if that timeframe is correct, it would mean he was only 10 years old that June. The bio write-up goes on to say that as a 19-year old in 1984, he took a job as an admin clerk in the Department of Home Affairs, and later became an interpreter at the local court. But by 1990, Khompela had apparently shot up the political ladder. If his own Facebook page is correct, he was mayor of Kroonstad between 1990 and 1992 (two years before the end of apartheid, and when Khompela would have been just 25). It must be remembered that Kroonstad in those years was gripped by politically motivated assassinations and violent terror, thanks to the Three Million Gang and the Self-Defence Units (SDUs). Khompela’s name is absent from the story of this period – and the mayor of Moakeng (Kroonstad) at the time was Caswell Koekoe. His bio information goes on to add that Khompela represented Kroonstad when the ANC held its first conference in Durban-Westville, after being unbanned in 1990. He also took part in the Codesa talks, it says. What is clear is that Khompela is an ANC party loyalist. By the time democracy dawned in 1994, he had been made a director in special education in the Department of Education. His Facebook page continues to map out a political career trajectory that includes becoming a member of the Free State Legislature, moving up the ladder to a position in the National Assembly before becoming chairman of the Portfolio Committee on Sport. After 10 years in this post he was back in the Free State to become a member of the legislature once more, before becoming MEC responsible for Police, Roads and Transport and now MEC for Health. During his time on the Portfolio Committee for Sport, Komphela was outspoken about transformation, and infamously raised the ire of the South African Council of Churches after he took vicious aim at then-Archbishop Desmond Tutu, calling him “treacherous”, and warning him not to confuse transformation with tokenism. He also locked horns with the likes of Moss Mashinini, who headed up SASCOC, and was slated as “slanderous” and “racist” for his take-no-prisoners approach to transformation in sport. Back then, Komphela earned a reputation for being something of a firebrand and a hothead. Other adjectives linked to the man include ‘irascible’, ‘power-hungry’ and ‘meddling’. But he was unapologetic, putting his outbursts down to being a man who calls a spade a spade, and someone who made transformation in sport a priority. Since grabbing headlines for his time serving on the portfolio committee, Komphela’s column centimetres have been dominated by his connection to a Robben Island ferry business in which he has ownership. In August 2008 the Mail and Guardian reported on Komphela’s interest in bidding for a ferry business operating from Cape Town’s mainland to Robben Island. It ended in a commercial dispute, said the newspaper, and the vessel involved became a white elephant (not unlike some of the brand-new hospitals in the Free State), stranded in a Cape Town boatyard. In June this year, Times Live reported that the MEC – who is chairman of Meltt, a business consortium – had bought a R60-million vessel to be a “back-up” ferry for tourists. The concern is that Komphela will have an unfair political advantage over other bidders and operators. But people waiting for surgery, or desperate to be seen by a doctor or to have an equipped ambulance arrive in an emergency, would prefer Komphela to spend more time getting the health department ship-shape, rather than being focused on cashing in on the tourist spend in Cape Town. * In May this year, numerous requests were made for an interview of any kind with the MEC. His spokesperson and his communications team responded, saying that they would try to make it happen. Despite much to-ing and fro-ing, with emails, calls and messages, it didn’t. Email questions were also sent to spokesperson Mondli Mvambi – among them, questions asking for clarity on the information on the MEC’s Facebook page, as well details of his plan of action for the Free State Health Department. No response has been received. 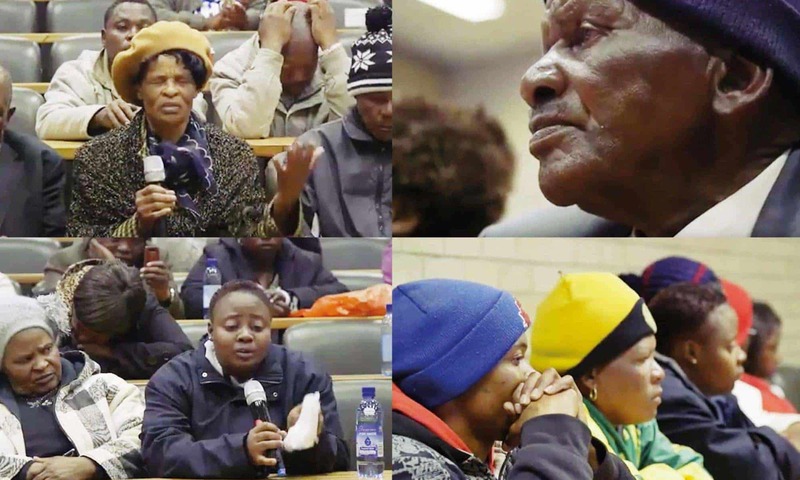 The Treatment Action Campaign has shared the following stories with Spotlight from their provincial operations in KwaZulu-Natal, Limpopo, Mpumalanga and the Free State. Elsewhere in this issue of Spotlight we take an in-depth look at Gauteng – which is therefore not included here. Branch members go door to door in France to find out how people in the community cope without a clinic. The community of France in KwaZulu-Natal does not have a clinic. A mobile clinic comes to the community just once a month. But most people don’t use it; some don’t even know about it. Instead they travel by taxi to other clinics – if they can find the money. Sometimes they must lie about where they live in order to see a nurse, or they simply go without medicines and health services altogether. Only certain community caregivers can deliver medicines to patients, if they have an ID, and if the patient is being treated at the mobile clinic. The rest, however ill, have to collect medicines themselves. It seems people are defaulting on ARVs, TB treatment and other chronic medicines as a result. We can never have #treatment4all – or #EndTB – when people can’t even get to the clinic. TAC members have asked the people of France how only having a mobile clinic affects them. The resounding response is that once a month is not enough. To resolve service deficiencies such as this one, which keep the dual epidemics burning, health system challenges must be addressed in the National Health Department’s test-and-treat plan and within the new National Strategic Plan on HIV, TB and STIs. Otherwise we are doomed. #FranceNeedsAClinic. Within a few hours of walking door to door through the streets of Khujwana it is clear there is a major problem. Every home has a story to tell – a story of frustration and suffering, a story of failure. While the local clinic looks functional, even ‘pleasant’, from the outside with its solid infrastructure and garden, inside it s a totally different matter. Many patients report ongoing stockouts and shortages of their medicines. They wait for hours before being seen by anyone – there is a shortage of nurses and no doctors ever come. Some go to other clinics altogether. People report incidences of nurses treating them badly, being rude or, worse, negligent. Mothers report the indignity of having been mistreated, or unattended to, in the midst of labour. Khujwana Clinic is failing the people and the community it is meant to serve. Tired of this situation, the community is mobilising. Testimonies from community members who try to use the clinic are being gathered. Local stakeholders are coming together to draw attention to the major shortcomings. All they want is a clinic that can give them the health-care services they need. They are clear: They will continue to escalate this issue until they #FixKhujwanaClinic. In Boekhouthoek a TAC branch member takes testimony from a community member struggling to access health services. Members of the TAC in Phuthaditjhaba have reported serious problems at Manapo Hospital that are putting people’s right to access health care in serious jeopardy. This report followed a strike by frustrated, overburdened staff members, including doctors, nurses, physiotherapists, porters, cleaners, and kitchen staff, who claimed to have not received pay for significant amounts of overtime since 2015. TAC members investigated the hospital and spoke to many patients entering and exiting the facility. Reports of long waiting times, a lack of nurses, doctors, and other staff being stretched beyond their capacity, and medicine shortages, were common. The Medicines Control Council (MCC) this week suspended what appears to be unlawful stem cell experimentation at Pelonomi, a state hospital in Bloemfontein. At the same time the Free State Department of Health has cancelled its contract with the stem cell company, ReGenesis Biotechnologies following a list of questions sent by Spotlight in connection with the involvement of controversial Health MEC Dr Benny Malakoane. Until a week ago the Free State department of Health was set to spend tens of millions of Rands on unproven and potentially dangerous stem cell therapies for the treatment of musco-skeletetal diseases in its orthopaedic knee patients at two hospitals. The treatment was run by a private company called ReGenesis Biotechnologies and has started on June 1. Mvambi would not explain why the case was now sub judice. Questions Spotlight sent to ReGenesis went unanswered, despite an initial request from ReGenesis CEO and the doctor carrying out the procedure Wian Stander that the questions be e-mailed to “Chevonne”. 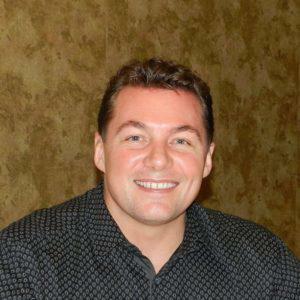 Stander is also listed as the “Owner and Integrative Medical Practitioner” of the Slimming Clinic in Bryanston. According to the website of the Slimming Clinic he has done talks on Holistic Medicine and Healthy Ageing in South Africa over the past few years. MCC Chairperson Professor Helen Rees confirmed to Spotlight that inspectors had been to the Pelonomi site last Friday and again on Monday. “Our concern was that the service level agreement made reference to medicines, injections and therapeutic research,” said Rees. “This is not a proven therapy and we were concerned about the reference to research as well as the fact that stem cells will be given to other persons. This led to questions whether this was in fact a clinical trial and if it was, the MCC has not given permission for it to be conducted,” said Rees, adding that their first priority was the safety of patients. Medical research that has not been approved by the MCC is unlawful in South Africa. “We have asked Dr Stander to stop enrolling patients and now await a response to the information we have requested from him,” Rees said. She said that “injecting anything into a patient comes with risk as you always run the risk of introducing infection. The contract also states that the Free State Department of Health and ReGenesis would establish a project management committee consisting of the MEC of Health as Chairperson as well as the CEOs of Pelonomi and Boitumelo hospitals, COOs and representatives from ReGenesis. It reveals that the committee shall meet monthly for the duration of the Agreement to “track progress, resolve pertinent matters to the effective and seamless treatment of patients”. The contract states that this agreement would run until 30 June 2019 with the department in essence guaranteeing 1 000 patients per annum, paying ReGenesis R30 000 for each treatment. There is provision in the contract for ReGenesis to motivate for treatment in excess R30 000. The contract also stipulates an upfront payment of a percentage of the cost of the three year contract, which also makes provision for a price increase after the first year. The Department also undertakes in the contract to supply ReGenesis with all consumables required. A source close to the MCC investigation confirmed that they have been unable to find evidence of a tender. However, Carte Blanche claimed last that a tender had been published in April seeking a service provider who can provide “cell based stem cell regenerative medicine and therapeutic research services”. Head of Department Dr David Motau confirmed to Carte Blanche that the contract had been cancelled. 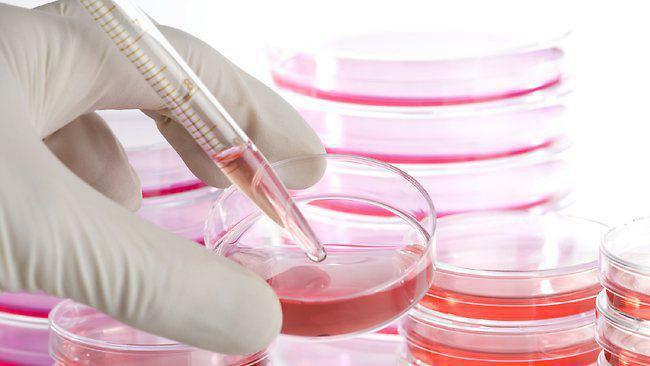 Substantial research is being done around the world into various stem cell therapies including for the treatment of arthritis and osteoarthritis of the knee. A search of the literature however shows no evidence from phase III trials indicating that any form of stem cell therapy is safe and effective for the treatment of knee problems. With few exceptions, medical treatments are only approved for use in humans once compelling evidence is available from phase III trials. The United States Food and Drug Administration has warned consumers against using unregistered stem cell therapies. They have also sent warning letters to companies providing certain kinds of stem cell therapies and in 2012 won a court case against the company Regenerative Sciences in which the court affirmed the FDA’s authority to regulate stem cell therapies making use of a patient’s own cells. The Free State’s health care system – in tatters in so many places – also has one recurring nightmare: Buthelezi Emergency Medical Services, to whom public emergency services have been outsourced. Why did the province’s services needed to be outsourced or supplemented in the first place? Secondly, was Buthelezi the best company to land the tender, and, thirdly, why are the on-going complaints about the company’s service – since it got the contract at the beginning of 2014 – falling on deaf ears? According to the Democratic Alliance’s questions put to MEC Benny Malakoane in August 2014, there were 106 ambulance and emergency services vehicles in the province, 54 were being serviced in workshops and 28 were about to be added to the fleet. 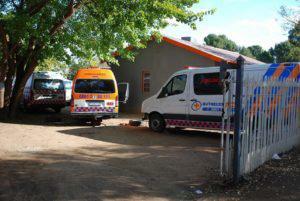 That year, Buthelezi EMS had been given the tender that comprises 47 ambulances for district and regional hospitals. Its staff was expected to have “basic life support and intermediate life support” training. This tender was also intended for emergency inter-facility transport, not for call-outs. According to a health department response to a DA question, billing is done according to the skill level of the paramedic attending to the patient. The contract is ongoing and by November of 2014 – the first 11 months of the contract was worth R32 million to Buthelezi. Pittaway says she’s never without fresh complaints about the services rendered by Buthelezi EMS. This is what worries her most. “We hear about ambulances arriving to pick up sick babies without incubators. We also hear that some clinics and hospitals are left without their blood-pressure machines and other equipment because they’ve had to hand them over to the ambulance staff. We’ve also heard how hospitals wait for up to two hours for an ambulance to arrive and, in one incident, the excuse for a delay in Gastron was that the ambulance had a flat tyre and the driver had to wait for a spare tyre to arrive. This kind of things is just not acceptable,” says Pittaway. A matron who spoke to Spotlight had her own horror stories that mirror Pittaway’s slew. She said they routinely give surgical gloves and drip kits to the Buthelezi EMS paramedics who are simply not properly equipped to do the job. 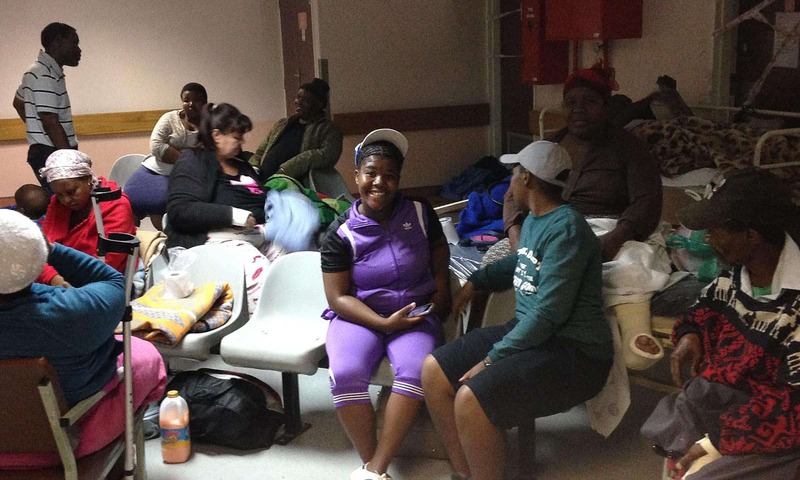 “They ask us for these basic things and then we get a bill for anything between R3500 and R4800 per patient,” she says. In a letter written by a doctor in the Xhariep area more complaints emerge. The letter details how a Buthelezi ambulance, supposedly with an advance life support paramedic in attendance, was ordered for a 1,2kg premature newborn at 4pm. The ambulance arrived at 7pm to transport the baby to Pelonomi Hospital in Bloemfontein. “The paramedic was handed the baby for transfer, but they had the wrong oxygen cylinder. The ambulance had to drive back to Bloemfontein to fetch the correct oxygen pin index cylinder. Unfortunately the patient deteriorated and passed away at 12.30am. The ambulance arrived after the patient passed away,” the letter read. It concluded: “We’ve had numerous problems with Buthelezi Ambulance Service in the past few months”. In Bloemfontein this autumn, Spotlight visited the Buthelezi offices, situated in a house on the industrial outskirts of the city centre. Ambulances appeared to be serviced or repaired in the backyard. This is a clear compromise of safety standards for emergency medical services. Outside Welkom, Spotlight saw Buthelezi ambulance vehicles and staff parked under trees. Tender stipulations require EMS private companies to have proper facilities where paramedics can take a shower, have a nap and recharge and refresh properly in-between assignments. Pittaway says it’s clear that Buthelezi EMS is plagued with problems, yet they continue to be defended by the department of health and continue to cost Free State taxpayers millions of rands. “We will continue to ask the questions because we don’t feel that we’ve been given good enough answers. We haven’t been able to pinpoint that the premier Ace Magashule and Health MEC Benny Malakoane have direct relationships with Buthelezi EMS, but we believe that how the tender was given out is problematic. We will keep up the pressure,” says Pittaway. Spotlight’s questions to Buthelezi EMS remained unanswered by the time of going to print. A simple well-managed idea is not only easing pressure on the Free State health care system and making HIV-positive patients’ lives easier – it also seems to be bringing down mortality rates amongst those with multi-drug resistant tuberculosis (MDR-TB). 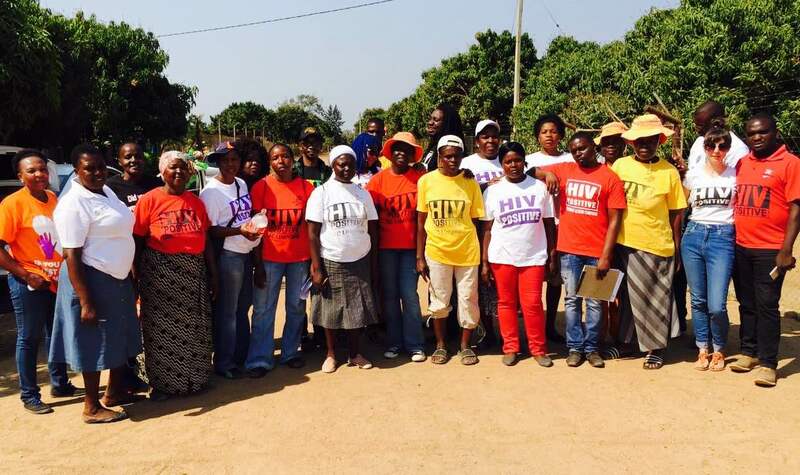 Médecins Sans Frontières’ HIV adherence clubs have grown, in under two years, to include 11 000 member in the Mangaung district. The idea was to create clubs of no more than 30 stable HIV patients (those with a viral load below 40) who meet every two months for less than an hour to collect their ARVs. Is this correct? Doesn’t undetectable viral load normally mean under 50, or is there a new test? Their medicines are pre-packed by a trained facilitator, so there’s no risk of queuing for an entire day only to be told there are no drugs or that there are too many people to be helped. At the club meetings, patients are weighed, given TB screening and are given a general health quiz. They can discuss issues among themselves, and facilitators also have the opportunity to raise any specific matters, like a change in medicine packaging. Members fetch their medicine and leave the clinic before the hour’s up. It means they can get on with their day with minimal disruption. Once a year they undergo a blood test at a clinic. This test is scheduled by their club. “It means there 11 000 people who are not clogging up the queues in clinic and hospitals. The patients are properly management and it’s proving to be a system that’s working,” says Trudie Harrison, a coordinator at MosaMaria, the public benefit organisation affiliated to the Anglican Church that manages and facilitates the adherence clubs in the district. The clubs are funded by Global Fund and Right to Care. Their support has translated into the purchase of four Wendy houses erected on clinic property. These structures serve as club meetings rooms and can also be used as extra facilities by the clinic. “At some of our facilities we do two sessions a day. Our staff is also trained and salaried. They are not volunteers on a stipend and that model has been part of what’s made the clubs work. “It also works that the club meetings happen at the clinic or hospital and not in a facility like a church hall. This removes some of the stigma that still exists around HIV/ AIDS,” says Harrison. MosaMaria’s success with the adherence clubs has led to them partnering with the Naledi Hospice and the Hospice Palliative Care Association of South Africa, working to manage multi-drug resistant tuberculosis (MDR-TB). The programme is aimed at reducing the rate of defaulting among MDR-TB patients and to reduce MDR-TB mortality rates. 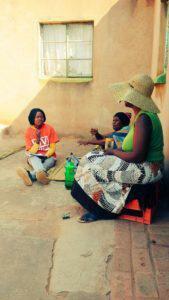 MosaMaria has one nurse and two caregivers on the programme. They currently visit 11 patients to give them a daily injection and other medicine. “This programme works because before, those with MDR-TB didn’t get treatment because they didn’t want to stay in hospitals. This way, the 24-month treatment can be administered by a nurse in the patient’s own home,” says Harrison. Harrison says it’s too early to measure the success of the programme but she says that since October 2014 they have seen the mortality rate decline. It’s significant because MDR-TB patients only have a 50/50 chance of surviving.